Foley Gallery is pleased to announce the first New York solo exhibition of artist Tiffany Dow. With this new body of work Doug Keyes presents a series of luminescent and semi-figurative photographs. By layering multiple exposures on a single piece of film Keyes compresses entire books into single images. These portraits are abstract representations that visually intimate the accumulation of information over time. 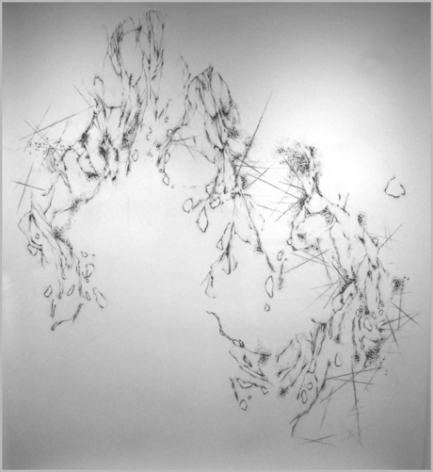 Tiffany Dow’s drawings explore the relationship between forms in nature and how we reconstruct them visually. 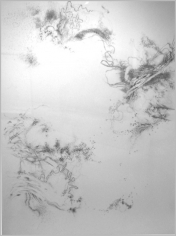 By combining the naturally occurring patterns found in nature with those forms found in the human body, she allows the micro and macro to merge creating complex organic compositions in charcoal. Dow’s childhood interest in scientific illustrations forms the foundation for her large-scale drawings. These large abstract landscapes, although not literal portraits, allude to the natural forms that inspire them. Non-linear in it’s portrayal, like the organic forms that they are based on, Dow’s work is created like a cellular composition. These micro-landscapes are composed of information coming together in piecemeal form. Just as our memory takes tiny snapshots of the landscapes that we inhabit, Tiffany Dow’s drawings reconstruct them like a collage of tiny images. Tiffany Dow lives and works in Northern California. She has been included in numerous group and solo exhibitions throughout the United States. Dow graduated with a B.F.A. in Painting and Drawing from California College of the Arts.